I have previously written about (here, for example) what I call economism, or excessive belief in the little bit that you remember from Economics 101. The problem is twofold. First, Economics 101 usually paints a highly stylized, unrealistic view of the world in which free markets always produce optimal outcomes. Second, most people in the world who have taken any economics have only taken first-year economics, and so they never learned that, from a practical perspective, just about everything in Economics 101 is wrong. (Complete information? Rational actors? Perfectly competitive markets?) This produces a nation of people like Paul Ryan, who repeats reflexively that free market solutions are always good, journalists who repeat what Paul Ryan says, and ordinary people who nod their heads in agreement. The problem is not the economics profession per se. These days, to make your mark as an economist, it helps to be arguing (or, better yet, proving) that the free market caricature of Economics 101 is wrong. The problem is the way it is taught to first-year students, which pretty much assumes that Joseph Stiglitz, Daniel Kahnemann, Elinor Ostrom, and many others had never existed. What we need, I have often thought, is a companion book for students in Economics 101, one that points out the problems with the standard material that is covered in the textbook. For a while I was thinking of writing such a book, but I decided against it for a number of reasons, one of them being that I am not actually an economist. Fortunately, John Komlos, who really is an economist, has written a book along these lines, titled What Every Economics Student Needs to Know and Doesn’t Get in the Usual Principles Text. If there is a central argument to 13 Bankers, it is that politics matters. The financial crisis was the result of a long-term transformation of the financial sector and its place in the overall economy, and that transformation occurred because of—and contributed to—a shift in the political balance of power. Daron Acemoglu and James Robinson, authors of Why Nations Fail, take up this theme on a much broader scale in their recent article in the Journal of Economic Perspectives, “Economics Versus Politics: Pitfalls of Policy Advice,” burnishing their reputations as two of the most subversive thinkers around. People have always known that economics and politics are related: that economic power produces political power and that political institutions constrain economic policy choices. Still, however, at least for the past several decades, the universal assumption has been that good economic policy is always good policy, full stop: for example, that it is always good to eliminate market failures. Why Is Finance So Big? This is a chart from “The Quiet Coup,” an article that we wrote for The Atlantic three years ago next month. 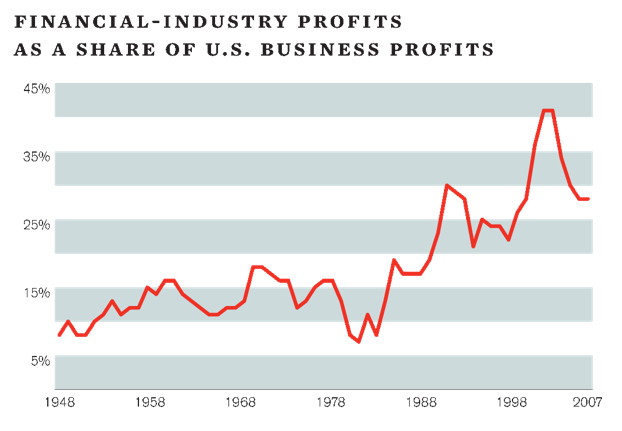 Many people have noted that the financial sector has been getting bigger over the past thirty years, whether you look at its share of GDP or of profits. The common defense of the financial sector is that this is a good thing: if finance is becoming a larger part of the economy, that’s because the rest of the economy is demanding financial services, and hence growth in finance helps overall economic growth. But is that true? Christina and David Romer’s new paper, “The Incentive Effects of Marginal Tax Rates: Evidence from the Interwar Era,” is available as an NBER working paper (if you are so lucky). Given the current debates about taxes, the paper is likely to garner some attention. In the central section of the paper, Romer and Romer regress reported taxable income against the policy-induced change in marginal after-tax income share. The after-tax income share is the percentage of your gross income that is left after taxes; policy-induced changes are those caused by tax changes rather than be macroeconomic changes. They do this for the top 0.05% of the income distribution, broken down into ten sub-groups by income, because the income tax only affected the very rich during the interwar years. Their headline finding is that “The estimated impact of a rise in the after-tax share is consistently positive, small, and precisely estimated” pp. 15–16). They find an elasticity of taxable income with respect to changes in the after-tax income share of 0.19. What Did the SEC Really Do in 2004? Andrew Lo’s review of twenty-one financial crisis books has been getting a fair amount of attention, including a recent mention in The Economist. Simply reading twenty-one books about the financial crisis is a demonstration of stamina that exceeds mine. I should also say at this point that I have no arguments with Lo’s description of 13 Bankers. Lo’s main point, which he makes near the end of his article, is that it is important to get the facts straight. Too often people accept and repeat other people’s assertions—especially when they are published in reputable sources, and especially especially when those assertions back up their preexisting beliefs. This is a sentiment with which I could not agree more. One of the things I was struck by when writing 13 Bankers was learning that nonfiction books are not routinely fact-checked (Simon and I hire and pay for fact-checkers ourselves). As technology and the Internet produce a vast increase in the amount of writing on any particular subject, the base of actual facts on which all that writing rests remains the same (or even diminishes, as newspapers cut back on their staffs of journalists). I’m not entirely convinced by Lo’s example, however. He focuses on a 2004 rule change by the SEC. According to Lo, in 2008, Lee Pickard claimed that “a rule change by the SEC in 2004 allowed broker-dealers to greatly increase their leverage, contributing to the ﬁnancial crisis” (p. 33). That is Lo’s summary, not Pickard’s original. This claim was picked up by other outlets, notably The New York Times, and combined with the observation that investment bank leverage ratios increased from 2004 to 2007, leading to the belief that the SEC’s rule change was a crucial factor behind the fragility of the financial system and hence the crisis. After my post on Corey Robin’s new book, a friend recommended Albert O. Hirschman’s Rhetoric of Reaction. As the title suggests, the book is about the rhetorical style of conservative thought dating back to Burke. Hirschman identifies three common tropes: perversity (that great-sounding progressive idea you have will have the opposite of its intended effect), futility (that great-sounding progressive idea won’t change anything, because you don’t understand the fundamental laws of the world), and jeopardy (that great-sounding progressive idea will destroy some other thing that we all agree is valuable, making everyone worse off in the end). Hirschman doesn’t dwell on this specific point, but it’s obvious that, similar to the argument Robin makes, these rhetorical devices can only exist in opposition to some progressive reform movement. I thought the description of the contemporary form of the perversity thesis (e.g., welfare programs create poverty) was especially good. “Here the failure of foresight of ordinary human actors is well-nigh total as their actions are shown to produce precisely the opposite of what was intended; the social scientists analyzing the perverse effect, on the other hand, experience a great feeling of superiority—and revel in it” (Belknap Press, 1991, p. 36). This seems to me an accurate description of why the Economics 101 ideology is so powerful. People get a sense of superiority from owning counter-intuitive theoretical insights—even if those insights are wrong. That’s from an excellent interview with economic historian Peter Temin in The Straddler. Temin’s main point is that what he calls general equilibrium approaches to macroeconomics have a political agenda, but they hide that agenda behind an ideology of naturalness. The “natural,” perfectly clearing, perfectly efficient economy, of course, has never existed and can never exist, but it is used to justify certain political prescriptions.